See also the Feast Days (Moedim) section of our teaching page for other articles. “You shall bring in from your dwelling places two loaves of bread for a wave offering, made of two-tenths of an ephah; they shall be of a fine flour, baked with leaven as first fruits to YHVH.” Leviticus 23:17, NAS95. 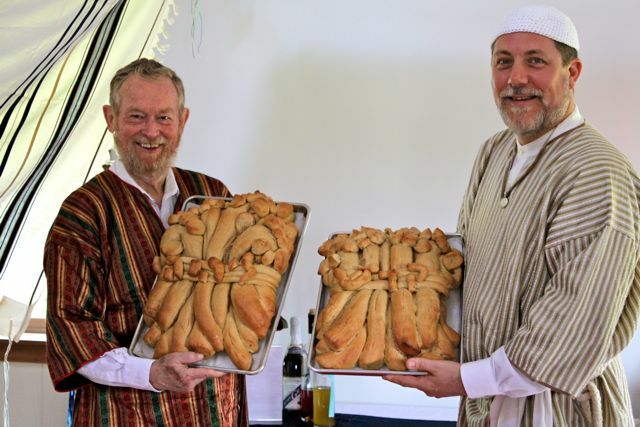 Photo at right: (click on photo to see a larger close up photo) Elders Lloyd Day & Yoseph Dombek holding the bread for waving made by Heidi Dombek and shaped into sheaves. 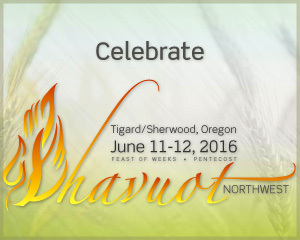 Often we are asked what do we do for Shavuot? It is our tradition to go to a place other than our hometown and celebrate from Erev Shabbat through the end of Shavuot (Sunday night). We have rented various places over the years, including an armory, conference/retreat centers, and various meeting halls at State Campgrounds as well as day-use picnic areas. 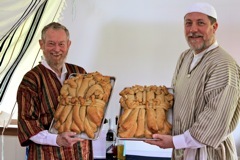 The Shavuot service generally includes a teaching on the meaning of Shavuot, praise & worship, and a liturgical part that includes calling the tribes to return to YHVH and waving of two loaves of leavened wheat bread. A chuppah is set up and after the initial waving of the loaves, each person takes a part of a loaf and waves it under the chuppah as well. Here is a link to the slides we created to use for the liturgical part of the service. It has been converted to html format so that you can view it in your web browser. As further explanation, when we call the tribes to return, all stand and face the direction that the tribe camped in and the name of the tribe is called out, such as "Ephraim, shuva l'YHVH" followed by sounding of the shofar. This is done for each tribe in turn.